Ordinarily when you think of mashing up a car and an airplane, you think about making a car that flies. That’s not exactly the notion that hit police officer Jeff Bloch when he came upon a vintage abandoned Cessna, however. He decided to cut off the wings, add the bottom of a van, and make the whole thing into a bizarre driving plane. The contraption is named Spirit of LeMons, and it was built to compete in a race called 24 Hours of LeMons, an event where unusual and falling-apart cars get on the racetrack and do the best they can. Bloch modified the vehicle to make it street-legal, giving it headlights, brake lights and turn signals. He’s got the proper plates and insurance to ensure that he can legally drive his crazy car around. 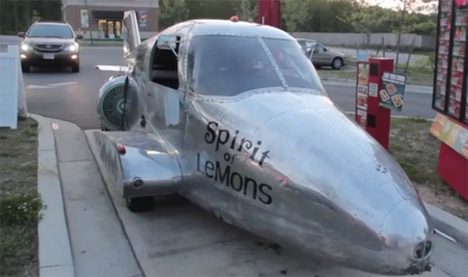 According to Bloch, people will follow him for miles when he’s driving the Spirit of LeMons just for the chance to talk to him and find out more about his decidedly unusual mode of transportation. In the near future Bloch wants to drive the vehicle cross-country; we can only imagine how many followers they’ll accrue on that trip. See more in Mods & Custom or under Transportation. August, 2013.